What is the schedule for the 2019 session? Parent Meeting: Thursday, June 13, 2019, 7:00pm, at Prairie Baptist Church, room TBA. Camp Week 1: June 20-21. Camp Week 2: June 24-28. Camp Week 3: July 1-3, 5. Camp Week 4: July 8-12 (12 is a half-day). 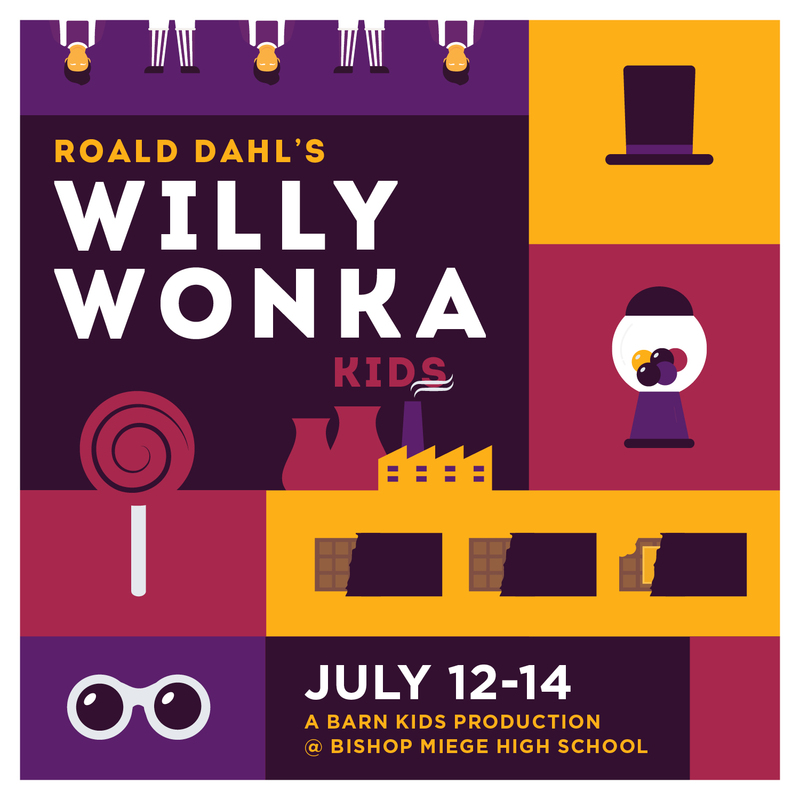 There are no auditions for the Barn KIDS production of Roald Dahl's WILLY WONKA, KIDS. Open enrollment will take place online on a first-come first-serve basis, with a limit of 35 student-actors. ONLINE ENROLLMENT IS CURRENTLY SCHEDULED TO OPEN AT 12:01AM, Saturday, February 16. Online enrollment will be from a link at the top of this page, and payment is due at the time of enrollment. Is any experience necessary for my child to participate? Roald Dahl's WILLY WONKA, KIDS is open to students of all abilities, from those with years on the stage, to those who are trying theatre for the first time. A fundamental component of the Barn KIDS program is bringing students from all levels of experience together so that they may learn from each other as well as staff members. We will work on acting, singing, and dancing skills during rehearsals, as well as learn valuable life skills such as collaboration and respect. What is the age range accepted? Students entering 3rd through 7th grades in the 2019-20 school year are eligible. There is a $395 per student tuition that helps defray costs for production, royalties, and staffing. The tuition package includes a package of opening night flowers, a quarter page “Break-a-Leg” ad in the program, and a photo CD from the show including head shots. Tuition payment will be due at the time of enrollment this year. All fees should be payed online through the same secure system that the Barn Players uses for its box office (Brown Paper Tickets). We will be gone on vacation for part of the time. Can my child still participate? Missing one or two rehearsals is almost an inevitable part of theatre due to illness, family circumstances, and life in general. Missing more than two rehearsals, however, adds extra stress to the actor, and is unfair to other students who are working on the production. If you know that you will be unavailable for a significant portion of the rehearsal window, we ask that you consider enrolling in a different session or respectfully allow that enrollment slot to be used by another student.